On December 11, 2013, the Environmental Protection Agency (EPA) announced that marine and inland water ports will have the opportunity to compete for $4 million in grants to help improve the air quality in local communities. The goal is to reduce diesel emissions from equipment built before cleaner standards were in place. These older engines emit pollutants that can cause serious health issues such as asthma, heart and lung disease, and respiratory illnesses. To participate in the competition, groups, governments, or businesses must submit a proposal by February 13, 2014, outlining their intended emissions reduction projects which may involve marine engines, short transport vehicles, cargo handling equipment, and locomotives. 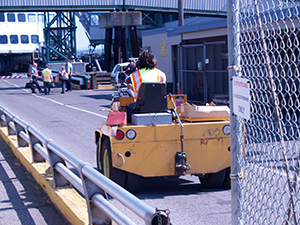 Help reduce illness among port employees working in locations with poor air quality by installing exhaust filters or cleaner burning engines, retrofitting older diesel engines to lower emissions, and providing personal protective equipment like respiratory protection.